) Preheat your waffle maker. No need to grease. 2) Add the filling between two slices of bread, make sure the cheese is not showing. 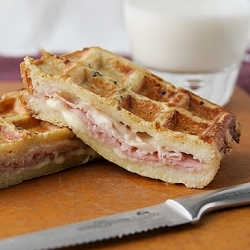 Cook sandwiches in batches (depending on the size of your waffle maker) until bread is golden and crispy. When ready, trim and slice to your desired shape and serve. This recipe makes about a dozen 4-inch square waffled graham crackers. 1. Mix the dry ingredients. In a separate bowl, whisk the milk, honey and vanilla. 2. Add the butter to the dry ingredients and rub together (or pulse in food processor) until the mixture looks like coarse cornmeal. 3. Add the milk mixture to the flour mixture until a dough forms. You may need to add a bit more flour, up to a half cup. 4. Wrap in plastic and chill for at least two hours, or overnight. 2. Waffle the dough. Waffle iron heat varies; check the dough after about three minutes. 3. Set aside the waffled graham crackers. 4. When you are ready to assemble the s'moreffles, place one waffled graham cracker on the waffle iron and top with chocolate and marshmallows. Place another waffled graham cracker on top, close the waffle iron (you may not wish to close it all the way), and allow the heat to melt the chocolate and the marshmallows — about one minute. 2. In a bowl, whisk the butter and brown sugar until smooth. 3. Add the eggs and vanilla, whisking to incorporate. 4. Stir in the flour, baking soda, and salt. 5. Add the oats and chocolate chips and stir to combine. 6. Spray the waffle iron with nonstick cooking spray. 8. Transfer the cooked cookies to a wire rack. 1. In a shallow container such as a pie plate, whisk together all ingredients except bread. 2. Soak a slice of bread in the mixture, flipping the slice to make sure the bread thoroughly absorbs the liquid. 3. Waffle until golden brown. This should take about five minutes, though waffling time will vary depending on your waffle iron and heat setting. I ate mine with a pat of butter and maple syrup. This recipe should make it onto a lot of weekend breakfast tables. Assuming you can wait that long. 2. In a separate bowl, combine the buttermilk and eggs. 3. Quickly combine the wet and dry ingredients. 4. Waffle in a lightly greased waffle iron until golden brown, about two minutes. 1. Mix the flour, salt, sugar and yeast in a large bowl (or in the bowl of a stand mixer.) Pour in the egg, butter or oil and the buttermilk. Mix with a large spoon (or with the paddle attachment of the mixer) until the flour is absorbed and the dough forms a ball. If the dough seems stiff, add a tiny bit of water. 2. Sprinkle the counter with flour, transfer the dough to the counter and begin kneading (or mix with the dough hook in the stand mixer). The dough should be tacky, but not sticky. If necessary, add more flour, a bit at a time. Continue kneading for about eight minutes. (If you're using a mixer, the dough should clear the sides of the bowl and stick slightly to the bottom.) Lightly oil a bowl and transfer the dough to the bowl. Cover. 3. Let rise at room temperature for about two hours, or until the dough has doubled in size. 4. Remove the dough from the bowl and divide it into 12 pieces. On a counter cleared of flour and wiped with a damp cloth, shape the pieces into tight rounds with the cupped palm of a single hand. 5. Assuming you will not want to waffle all 12 buns, line two baking sheets with parchment paper. Place the dough pieces on the paper and press down to form the bun. At this point, the dough can be frozen. Just bring the pieces back to room temperature in a sealed, oiled zip-top bag before proceeding with the next step. 6. Let rise for 60 to 90 minutes, loosely covered with plastic wrap or a towel. The buns should be nearly doubled in size. They are now ready for waffling. Place the dough on the iron and close the lid. Check after about five minutes. You want the waffled buns to turn out golden brown and crisp. Season the beef and form it into a very thin patty. Place in the waffle iron and cook about four minutes. When your patty has cooked, remove it from the waffle iron. If you would like a waffleburger with cheese, top the patty with cheese, place it in the waffle iron and allow to waffle very briefly — about five seconds. Garnish with the condiments of your choice. Revel in the triumph of the ridiculous. Combine egg, milk, sour cream and butter; mix until well blended. Fold in bacon and cheese. Bake in preheated waffle iron according to manufacturer's directions until golden brown. Combine flour, milk, baking powder, and salt in a very large bowl. Cut in shortening until it resembles coarse cornmeal. Store in tightly closed covered container in a cool place. In a small saucepan, melt the chocolate and butter over medium-low heat; pour into a bowl and set aside to cool. Stir in the sugar, eggs, and vanilla. Add the flour, cocoa, espresso and salt and stir just until combined; the batter will be thick. Makes 6-8 Belgian-style waffles, each breaking into 4 wedges (about 2 dozen total). Bedien met gebakte eier, tamatie en lekker bros gebraaide spek. 1. Bloom the spices in butter**: Heat 4 tablespoons butter in skillet over medium heat until melted, 1 to 2 minutes. Continue to cook, swirling pan constantly, until butter is light brown and has faint nutty aroma, 2 to 4 minutes. Add spices and continue to cook, stirring constantly, 15 seconds. Remove from heat and cool to room temperature, about 30 minutes. 2. Combine the flour, salt, sugar, baking soda. 3. Mix together the buttermilk (or buttermilk substitute) and the egg yolks. Stir in the spiced butter and vanilla. Spray the waffle iron well and preheat it. Stir the wet into the dry ingredients. 4. Beat the egg whites in a separate bowl with a whisk or electric mixer (make sure bowl and mixer are spotlessly clean) until they hold soft peaks. Stir them gently into the batter. Add carrots, walnuts, and raisins. Stir gently to combine. 5. Spread a ladleful or so of batter onto the waffle iron and bake until the waffle is done, usually 3 to 5 minutes, depending on your iron. Spray iron with cooking spray between waffles as needed. **If you prefer a quicker breakfast, you can melt and cool the butter plain instead of browning it and blooming the spices in it — but doing so does add flavor. If you do skip the spice blooming, simply add the spices to the dry ingredients in step 2. Add your plain melted, cooled butter instead of the spiced butter in step 3. *** Waffles also freeze well. You can make a big batch, allow them to cool, and freeze them for a homemade alternative to preservative-laden commercial frozen waffles. Meng al hierdie bestanddele deeglik saam. Bak in jou wafelpan tot goudbruin. Jy kan ook gebraaide spekstukkies en kaas by die beslag voeg voor jy dit bak. Jy kan nou hierdie aartappelkoekie bedien as ontbyt met brosgebraaide spek en 'n gebakte eier bo-op. Met heuning en brosgebraaide spek as 'n voorgereg. Of maak 'n lekker toebroodjie met slaai en hoendermayo. Bak 4 - 5 minute tot spek gaar is.